Grey squirrels damage trees by gnawing at the stem to get to the sweet, sap filled layers (phloem tissue) just beneath the bark. This tissue is responsible for the movement of sugars around the plant (known as translocation). If this gnawing extends around the stem so the tree is ‘ringed’ i.e. 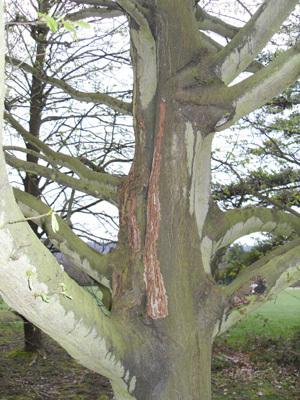 a complete circle of bark and underlying tissue is removed, then the movement of sugars around the plant will come to a halt and the tree will die. Removal of any bark and associated tissue will check or restrict the growth of trees. This bark stripping occurs between late April and the end of July. Very young trees or saplings (stem diameter less than 5 cm) are generally not attacked as they cannot support the weight of a squirrel, the main stem of older trees (40 years+) are usually safe as the bark is too thick for the squirrels to strip. The most vulnerable trees are sycamore, beech, oak, sweet chestnut, pine, larch and Norway spruce, aged between 10 and 40 years old; though almost any broadleaved species of tree can be attacked. Bark stripping is a problem in woodland where the squirrel numbers are greater than 5 squirrels per hectare. The risk of damage may be greatest where there are vulnerable trees next to mature woodland that produces a good seed crop, which in turn supports a high density of squirrels. Some of the damaged trees will die, some will succumb to fungal infection. Where the fungus enters, the wood will become stained and may rot. In many cases, the stems will be deformed which reduces the value of the timber. If branches in the canopy are attacked, dieback may result and again the quality and quantity of timber produced is affected. Damage is recognised to be associated with high numbers of squirrels, especially juveniles entering the population during early summer, and tends to occur at densities of 5 or more squirrels per hectare (ha). This occurs when there has been successful spring breeding (from January to April) following a good seed/mast crop the previous autumn. Note that average summer densities in mixed woodland habitats are around 8, but may reach 16 per ha. Damage risk will be highest where stands of vulnerable trees are adjacent or in close proximity to mature mixed woodland areas producing good seed crops, as these will support high squirrel densities. Up to 5% of damaged trees may die and many more will have degraded timber value through stem deformation, rot and broken tops. Oak, poplar, Scots pine and Norway spruce are particularly vulnerable to stem breakage. 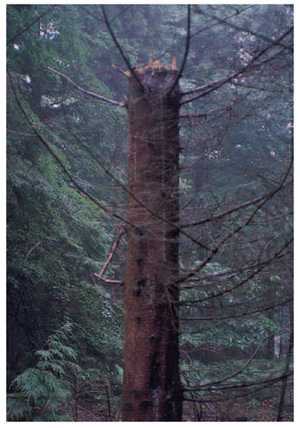 Top blown out of 40-year-old Norway Spruce following squirrel damage (Forest of Dean). Fungal invasion at the damage site causes staining and rotting, reducing the value of the timber. Callusing is common and disguises damage or staining present in the timber at felling age. There may be a reduction in annual increment of up to 2 yield classes, and damage to branches in the canopy may cause dieback, with timber yield being affected if 30% of the canopy is lost. Predicting years of high squirrel damage will enable better targeting of control, reducing both costs and the number of squirrels killed. 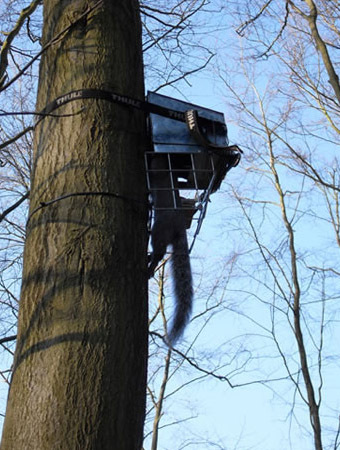 A new method (Index Trapping) is currently being developed. 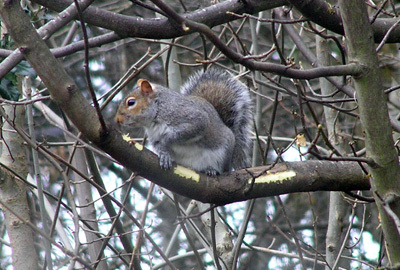 This explores the relationship between grey squirrel populations, winter food availability, spring breeding success and damage the following summer. Bark stripping at a National Trust property in the South of England. 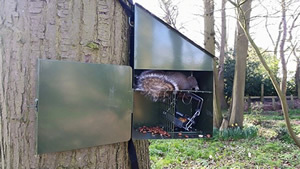 Grey squirrel traps are set during a week in early January in habitats likely to hold high density squirrel populations (i.e. mature broadleaved or mixed woodland) adjacent to damage vulnerable habitat. Control for tree damage prevention should aim to reduce resident squirrel densities to below damaging levels (<5 per ha) just prior to and during the main damage period (April–July). It should be targeted in good squirrel ‘holding’ habitat adjacent to damage-vulnerable plantations. However in areas managed under ‘continuous cover’ holding and vulnerable areas will be intimately mixed. Studies have shown that all resident squirrels in a previously marked population can be trapped or poisoned within 5 weeks. months and a non-isolated area within 1 month. Thus killing squirrels at any other time of year will not reduce subsequent levels of squirrel damage. The timing of control is important. Starting too early will allow grey squirrels in neighbouring areas to move in before the beginning of the damage period, resulting in a greater control effort and unnecessary killing of animals. Tree seed remaining on the woodland floor will also reduce the efficacy of the control measures9. Starting too late may not allow time to reduce the population sufficiently to prevent damage. Control, using live and spring traps or warfarin poison, should continue throughout the damage period to remove recolonising animals. Effective squirrel control may be difficult where the holding and adjacent damage-vulnerable woodlands are in different ownership. Collaborative control, through either informal or formal ‘Squirrel Control Groups’, enables better planning of control over wide geographic areas. It also provides the potential for joint contracts for control, or other strategies.